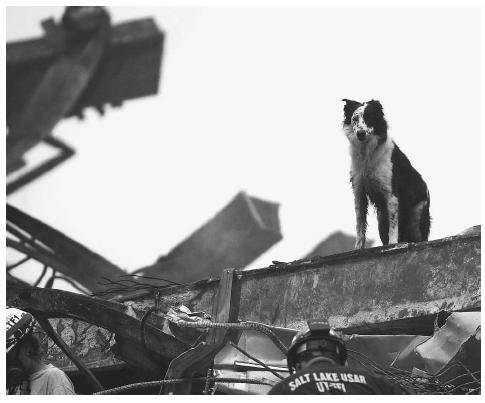 "Cowboy," a search and rescue canine for the Federal Emergency Management Agency (FEMA), pauses during his work searching the World Trade Center site in New York in September, 2001.
the U.S. federal government tasked with responding to all aspects of natural and manmade disasters. This excludes specialized response capabilities such as those of radiological teams—although FEMA works with these—but includes all phases of disaster response, mitigation, and prevention. Created by a 1979 executive order, FEMA employs some 2,600 people at its headquarters in Washington, D.C., and at sites across the nation. Early history. Federal efforts at disaster relief had their beginnings surprisingly early, in an 1803 congressional act authorizing assistance to a New Hampshire town ravaged by fire. Over the next century and a quarter, more than a hundred pieces of ad hoc legislation were passed in response to floods, hurricanes, earthquakes and other disasters. The establishment of the Reconstruction Finance Program (RFP) under the New Deal of President Franklin D. Roosevelt in the 1930s finally gave shape to federal disaster-relief efforts. The RFP, which made loans for repair and reconstruction in the wake of disasters, was soon augmented by the Bureau of Public Roads, which provided funding for the replacement of roads and bridges, and by the Flood Control Act, designed to enable the U.S. Army Corps of Engineers to implement flood control projects. During the 1960s, a series of hurricanes lashed the United States, prompting the establishment of the Federal Disaster Assistance Administration within the Department of Housing and Urban Development. In 1968, Congress passed the National Flood Insurance Act, which increased the flood protection afforded to homeowners. The Disaster Relief Act of 1974 established the principle and process of disaster declarations on the part of the president, whose executive powers were sufficient to direct resources to ward relief. With more than 100 federal agencies involved in some aspect of disaster relief, the need for a coordinating agency became apparent, and in 1979 President James E. Carter issued an executive order creating FEMA. The new agency absorbed a number of entities, among them the Federal Preparedness Agency of the General Services Administration, HUD's Federal Disaster Assistance Administration, and the Defense Civil Preparedness Agency of the Department of Defense. FEMA today. In its first quarter-century of existence, FEMA dealt with a vast array of natural and human disasters, including the nuclear accident at Three Mile Island in Pennsylvania in 1979, the Cuban refugee crisis in 1980, the San Francisco earthquake in 1989, Hurricane Andrew in 1992, floods in the Midwest and West in 1993, and the terrorist attacks of September 11, 2001. The appointment of James L. Witt by President William J. Clinton in 1993 put FEMA for the first time under the leadership of a director with experience as a state emergency manager. Witt undertook wide-scale reforms that streamlined relief measures. Thanks to the end of the Cold War, he was also able to direct resources from civil defense toward disaster relief, as well as recovery and mitigation programs. In the post-September 2001 era, a new type of "civil defense" emerged: homeland security. FEMA became part of DHS when the latter was formally established on March 1, 2003. Organization and mission. In addition to its 2,600 full-time employees, FEMA has between 4,000 and 5,000 reservists. Its force operates out of FEMA headquarters; the FEMA training center at Emmitsburg, Maryland; the Mount Weather Emergency Operations Center in Virginia; and other facilities. FEMA often works in partnership with other groups, including some 27 federal agencies, state and local emergency management agencies, and the American Red Cross. The mission and activities of FEMA relate to what the agency's own literature describes as the "life cycle of disaster." Starting with the disaster itself, there is the response phase, followed by recovery, mitigation, risk reduction, prevention, and preparedness—all of which makes the nation and its communities more equipped to deal with future catastrophes. Among the specific activities FEMA undertakes are assisting with flood-plain management and implementation of building codes; teaching local communities how to survive a disaster; and equipping state and local emergency teams to prepare them for a disaster situation. In the event of a calamity, FEMA helps coordinate the federal response, and makes disaster assistance available to states, communities, businesses, and individuals. It also trains emergency managers, supports fire services nationwide, and administers national flood and crime insurance programs. Gore, Albert. Federal Emergency Management Agency: Accompanying Report of the National Performance Review. Washington, D.C.: Office of the Vice President, 1994. Landesman, Linda Young. Public Health Management of Disasters: The Practical Guide. Washington, D.C.: American Public Health Association, 2001. Therese, McAllister, and Gene Corley. World Trade Center Building Performance Study: Data Collection, Preliminary Observations, and Recommendations. Washington, D.C.: Federal Emergency Management Agency, 2002. Adams, Shawn. "A Beginner's Guide to Learning Emergency Management." Risk Management 49, no. 5 (May 2002): 24–28. "Reports Shed Light on World Trade Center Collapses, Look to Safer Structures in the Future." JOM 54, no. 6 (June 2002): 6. Rubin, Debra K. "FEMA and Corps Plan New Guide for Terrorism Catastrophes." ENR 249, no. 15 (October 7, 2002): 14. Federal Emergency Management Agency. < http://www.fema.gov > (March 26, 2003).